It is indeed that time of the year again. With all the Christmas cheers and the holiday spirit, I am pretty certain that you are also at a lost as to what gifts to give. You might think that the more expensive the gift, the better. However to what expense on your end? Christmas is getting near and I am sure that many are bugging you for gifts. Yet, in fact of it all, there’s no need to put that big hole in your wallet and more so in your bank account. There are many ways for you to still be able to deliver that whilst cutting costs. I am certain that your holidays would be merrier without that extra burden in your wallets. We are talking about frugal gift giving ideas. Perhaps you might ask, any suggestions? One idea would be regifting Christmas presents. Regifting is the process of gifting the presents you received. But hey, before you jump in any conclusions whether if this is ethical or not, here are the things you need to keep in mind. The first one is you are trying to save money. We all know that the process of gift giving can really take a toll in our finances. Needless to say, if we have every inch to save such for gifts, we would gladly do it. The second thing to remember is to only give gifts that are just sitting in your house and you will not use ever. Rather than those items would be collecting dust in your closet, might as well give it to someone else who would maximize its use. You are just giving justice to the items you received. Plus, no need to spend a peso for it. When deciding to pursue regifting, here are three rules to abide. Think and discern the gifts. You need to open the gifts first that you got and assess if it is worth regifting. You see, you can’t just regift the item if you think you don’t need it ever. However, if the gift is something precious like an heirloom or something of great value that was given by someone important like a family member, don’t regift it. Consider also the potential of the gift. Make sure that it is still in its excellent condition and it is something that you are proud to give to someone else. You also need to guarantee not to give it to someone in the same circle as the giver. That would be one embarrassing scenario. The next rule would be to personalize it. Sure you already unwrap the gift hence it would be important to take off the Christmas card addressed to you and replace it with another one. Find a good wrapper and perhaps put a little ribbon here and there and attach your Christmas card. If you can still personalize the gifts, the better. For instance, if you got a mug last Christmas and you would want to regift it, perhaps you can personalize it and inscribe the name of your recipient in there. When regifting, you need to make sure that the recipient can really make use of the gift. As what Dave Ramsay said, don’t regift something for the sake of regifting it. Don’t just give for the sake of giving. You need to make sure that it can really be useful and something they would need. Because in the end, if they won’t use it, the gift would be collecting dust still in your recipient’s home never to see the light of day again. Regifting Christmas presents can indeed save you a lot of money. Plus, it can also help declutter your homes too. However, you also need to make sure to abide with the rules stated above. 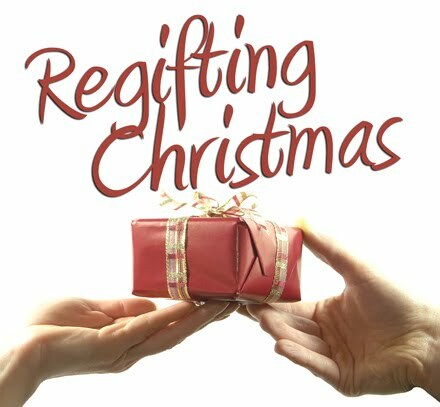 It takes a lot of thinking and discerning with regards to regifting. Bottom line is, you are giving the gift to another owner hence not putting it to waste and more so save money in your end.